Editor's Note: This is a fully revised look at documentary budgeting, and updates the 2006 Documentary article “Don’t Fudge on Your Budget: Toeing the Line Items.” It was recently presented as a workshop at Getting Real ’18. As filmmakers, we yearn to immerse ourselves in the creative process. We pursue people, stories, issues and ideas that fascinate us. We strive for cinematic ways to bring those stories to the screen. And we spend years in the field and the edit room, working through the labyrinthine, wonderful, frustrating process that documentary-making can be. Yet after embarking even timidly on a first project, it quickly becomes clear that there are also crews to be hired, workflows to suss out, schedules to draft, and money to be raised and spent. This is show business and our work is half “show” and half “business,” whether on a huge doc financed by a studio, or on a passion project made by a lone filmmaker in a small town, who must wear all hats herself. At the center of much of this “business” is the budget, which offers a map of the filmmaking process, expressing both the film you’re planning to make and how you plan to make it. Ideally, it is also a living document that can help get a film to completion. There’s an adage that I love called the “Triangle of Quality”: “Fast, cheap or good—pick two!” This means that if you want something cheap and fast, it’s probably not going to be very good. If you want something fast and good, it’s not going to be cheap. Want good and cheap? Go slow. 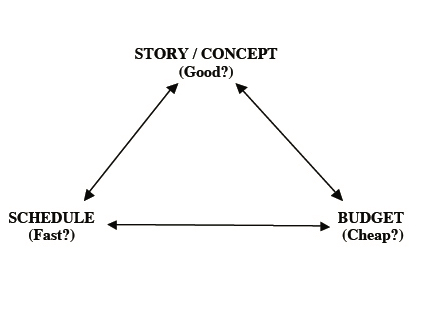 In film production, I’d make the corners of this triangle the story itself, the schedule and the budget. Changes to one of the three “corners” of this triangle will always affect the other two. Thus, before you can think about your budget or schedule, you must think about your concept. Are you making a longitudinal vérité film over many years? An urgent investigation? An archival essay? A docu-fiction hybrid? As your concept crystallizes, sketch out a schedule. How long will you research, shoot and edit? Are there any special constraints, such as a tight shooting window or an immovable delivery deadline? No budget can exist without a schedule, and every (inevitable) schedule change will affect the budget. As a final preparatory step, list the key assumptions that define the budget. How long will the film be? What format will you shoot and deliver on? Where will you shoot? How much archival material will you use? Most budgets list these basic assumptions at the top of the budget. More complex films might even have a page or two of assumptions attached to the budget. This serves as a warning: if these assumptions change, the schedule and budget will too! It’s worth noting that many projects start with an assumption about the budget itself. If you know that you’re making a nights-and-weekends project and plan to self-finance $10,000 of hard costs, or that you’re working with a contractually fixed $350k, or that you’re aiming for a $1 million+ budget with studio partners, those are important assumptions for budgeting! Before you start budgeting, you need to establish “the finish line,” or how much of the life of the film to include in the production budget. If you have been commissioned to make a film for a studio or client, the finish line may be clearly established in a contract. But if you are producing independently, you will likely want to include all of the costs required to premiere a film at a major film festival, promote it there, and—hopefully—deliver to prospective buyers. But even that may not be enough. What if those “prospective buyers” don’t bite? Or if hybrid distribution, based on deep connections you have developed with your audience, turns out to be a better choice for your film anyway? What about a website, publicity, social media or impact campaign? Some funders don’t allow these items on the production budget, so they may need to be budgeted for separately. Either way, you need to keep the whole life of the film in mind as you budget and fundraise. Fundraising: “Upfront” or “Phase by Phase”? A good budget reflects, and must serve, the fundraising process. In the case of commissioned films, the full budget might be guaranteed upfront. This makes the budgeting process (and everything else!) much easier. But for most independent filmmakers, funds come in phase by phase—if they come at all! A little bit of development funding supports the creation of a fundraising trailer, the trailer unlocks production funding, an early rough cut garners post-production funding, etc. The process is risky, there are stops and starts, and almost inevitably a filmmaker ends up self-funding various parts of the process and underpaying (or just not paying) her/himself. (Hence the challenging “career sustainability” questions facing our field.) How does one budget in the face of such uncertainties? First, you’ll probably want to break your budget into phases. Then, you may need high/medium/low scenarios to account for the uncertainty of fundraising. The high scenario should include full professional rates and will be the budget that you’ll submit to potential funders. The “mid” and “low” scenarios should be kept to yourself. The “mid” scenario will involve some compromises, and the “low” version will be the absolute minimum needed to complete the project acceptably, although it might include calling in lots of favors and making some sacrifices. I draft the “full professional” budget first, and then, as needed, add columns breaking it into phases and high/mid/low scenarios for each phase. (See Figure 2 below) This enables me to constantly adjust for available funds while still always pushing to fundraise for the full budget. This article will focus on creating the “full professional” budget. Once created, you can make “mid” and “low” scenarios by reducing and deleting appropriate items. The sample budget is for a $1.5 million doc. I chose to present a very high budget (higher than any doc I have ever made!) to show full professional rates for everything, and the full scale of what is possible. It also helps to remind funders and filmmakers just how much everything really costs, which is crucial for conversations around sustainability. But, while there are many docs being produced at this level (and higher! ), I deeply respect the fact that doc budgets start at zero. Some projects only raise $10-20k to cover basic hard costs, and others are only ever partially funded, and involve huge contributions of volunteer labor and services. A cluster of funded docs end up in the $350-450k range, although even this range often relies on either a small number of shooting days, a producer/director/writer/cinematographer/editor wearing many hats herself, or various unfunded phases of the process. There is another cluster in the $600-800k range, which tend to be closer to this sample. In general, in my first pass I estimate everything slightly high, using full professional rates. Then, once I see where I am overall, I decide which line items I can reduce, and which compromises will help me bring the budget down towards its target. 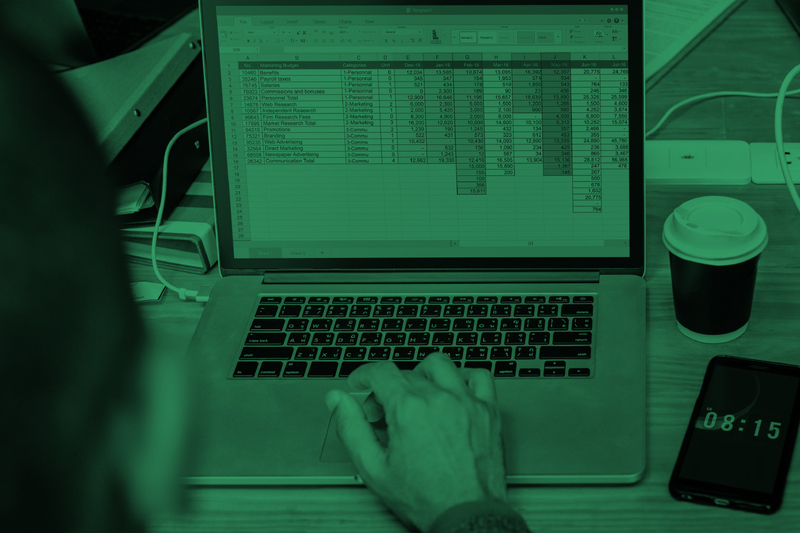 I use Microsoft Excel or Google Sheets for budgets. Some producers prefer specialized software like Movie Magic, but I love the flexibility of a spreadsheet, where I can add columns for phases and high/mid/low scenarios. Now let’s start to explore the actual budget (See below for links to download the budget template.). The topsheet offers a one-page summary, and usually includes the assumptions, income and expenses. There are two main approaches to budget organization. Some keep all of the staff together in one section, while others account for staff members within each department (Camera Crew listed under Camera Department, etc.). I tend to keep the staff together, as this is generally preferred by non-film funders, and is fine for film funders too. Let’s look at how the budget is setup. Every line item has an account number to its left. This same numbering system—known as a “Chart of Accounts”—is used in the accounting system so that actual expenses can be compared to the budget at any time. It doesn’t really matter which Chart of Accounts you use, as long as you are consistent, though some studios or networks may require you use their Chart of Accounts to integrate with their accounting system. Units, Allows, Flats. In the “Units” column, you’ll often see “days,” “weeks” or other specific units that shows how each quantity was determined. An “allow” in this column means an estimate. You could “allow” $1,000 for office expenses for your entire production. But it is best to avoid “allows” whenever possible because they are vague and open to debate. Instead, it’s better to budget Office Supplies for 10 months @ $100/month, which is much clearer and easier to defend. Empty Lines. You’ll notice that the sample budget includes some lines where no money is being spent. Normally, these would be hidden, but they are included here to make the template more useful. 1000 Staff for the Development Phase—the producers, directors and staff costs for development phase. 1100 Research—books, videos, meetings and other research expenses. 1200 Research Travel—In sections like travel, I detail each trip and who is traveling where. This heads off questions about unexplained airline tickets, etc. Note that travel costs are often—and wisely—scrutinized by funders. 1300 Production & Post-Production of Fundraising Sample—A fundraising trailer is essential for most projects. This sample budget covers eight shooting days and two weeks of editing. Depending on the project, this could be much more complex. 1400 Fundraising Costs & Materials—covers grant-writing, drafting budgets, market registration fees, promotional materials, etc. Costs will vary based on how much research and revision is required, and how much the film team can do in-house. 1500 Fundraising Travel—travel to markets, to meet with funders, etc. 2000 Directors, Producers, Writers—These fees vary widely but should be reasonable for each person’s experience level, production locale and overall budget level. In this sample, the Director/Producer/Writer plans to spend two years full-time on the project. This fee could easily be higher and reach 10% of the budget. In this case, the Producer is budgeted slightly less than the Director/Producer, based on the assumption that the Director/Producer owns the project and will be working long before, and long after, this two-year period. If this was a commissioned project with a director working for hire, this balance might be reversed. On union projects, be sure to comply with any applicable guild agreements. 2100 Production Fee—Some funders require the rental of all producer-owned equipment to be represented as a single production fee, so I have left that here as an option. 3000 Story & Other Rights—If your project is based on a book, article, song or other copyrighted material, you may have to pay for the rights to make a documentary based on that material. 3100 & 3200 Archival Photographs & Footage—This includes the costs of researching and licensing material, with the exception of the archival researcher who is listed under “Staff.” Here, the devil is in the details. For example, many archives charge a 30-second minimum, no matter the length of the clip that you use; you thus may need to budget for many more seconds than you use on-screen. 3300 Talent—If you are planning to do reenactments, or hire a narrator, you’ll need to list talent here. Rates vary considerably and may be subject to union or guild agreements. Also, be cautious if you’re shooting in a theater, concert hall or sports arena under union jurisdiction that may have specific rules about filming. 3400 Music—In the sample, nearly all music is composed, produced and delivered by the composer, and only two songs are licensed, at relatively reasonable rates. Projects with more extensive licensing needs may require a music supervisor. Licensing songs (or commissioning them) can easily become very complex and incredibly expensive. 4000 Production Staff—The composition of the crew and their rates can vary considerably, and it is often the budget that reveals to your funders exactly how you are planning to make the film. Keep in mind that while crew rates are somewhat negotiable, it’s best to maintain parity among different crew members. 4100 Editorial Staff—Documentaries truly are made in the edit room, and a talented editor might just be the single most important line item in the budget. Bigger films may have multiple assistant editors working simultaneously, while on low-budget projects, it is often the director who knows the material best and who may perform some assistant functions. In both staff sections, the last item is Personnel Taxes. These are the costs that an employer must pay in addition to an employee’s salary, and include Social Security, Medicare, federal and state unemployment insurance, workers’ compensation and union or payroll service fees, if any. A payroll service can provide you with current rates for the states where you’ll be shooting, and can also process these payments. For international shoots, it is often best to work with a production services company that can handle local compliance for you. Beware: Some producers try to avoid personnel taxes by classifying crew as independent contractors. The IRS, however, has very specific rules about who is an employee and who is a contractor, and this is often not possible. Consult your attorney or accountant. 5000–5500 Production Expenses—These sections detail the camera, sound, lighting, grip and other equipment, facilities and services required to shoot the documentary. Equipment rentals for long-term projects are tricky because they can sometimes exceed the cost of purchasing equipment. In these cases, the production may choose to buy equipment and then re-sell it at the end of production (which is often estimated as a net cost of 50% of the purchase price), or the production may rent gear from crew or from a rental house. Many funders have policies that such rentals cannot total more than 50% of the purchase price, which would be equivalent to the buy/sell scenario described earlier. The multiplier of 0.50 next to these items accounts for either scenario. (Some funders allow 75%, while others specify different percentages based on how long each type of equipment can be amortized.). Note that very experienced crew members will generally prefer to work with their own gear that they have invested in, know intimately and will likely enable them to do their best work. 5600 Production Film & Lab—This covers hard drives for field materials and multiple back-ups. It would also include film stock and processing, if needed. 5800 Local Expenses—Take special note of line 5830, “Crew Meals.” Nothing tells a crew that you respect their work and talent more than providing proper meals. I once line-produced a low-budget feature where we served hot breakfast in addition to lunch. The crew arrived early every day for breakfast and started the day happy! Sometimes a little money goes a long way. 6000 Travel Expenses—Travel expenses add up quickly and are often scrutinized by funders. Try to keep travel to a minimum, and consider when you can hire local crew. When you must travel, always seek out advice from people who have shot in the location before. 7000–7700 Post-Production—As problems arise during production, someone will suggest that you “fix it in post.” But that can get expensive, fast. It’s better to think of post as the second half of a marathon. You can’t afford to carry too much baggage from the first half. You’ll be best prepared by doing plenty of research and by selecting your editor, online facility, colorist and sound designer before you shoot. Talk through the intricacies of your workflow and delivery requirements. Do end-to-end workflow tests. These conversations will help you budget post, and may also uncover cost and time savings for production. Note that the cost of some aspects of post depend on how much money you have. Should you spend 24 hours or 50 hours doing color correction? It depends on how slowly and carefully you want to go, but also on what you can afford. 8000 Insurance—Film production is like war. Cars and property get damaged. People get hurt. Releases that weren’t signed or rights that were misunderstood create risk. You need insurance. General liability and other coverages protect during production, while Errors & Omissions is required for commercial distribution. And some coverage, like Workers’ Compensation, are required by law. The best way to assess your needs is to consult with a broker who specializes in the entertainment industry. 9000 Office & Administrative Costs—It’s often helpful to budget these by the month. Note that the sum of the production office and edit room rental line items allows more for an office suite. 9300 Professional Services—Talk with your attorney ahead of time to estimate legal costs, which can add up quickly. Fact-checking, accounting, tax preparation and other professional services are also budgeted here. These sections cover the early festival and distribution life of the film. Each section could easily be expanded into a full budget if desired, and some sections, like Impact, are clearly limited to just R&D, to develop a separate proposal and budget for a potential impact campaign. Keep in mind that some funders, especially broadcasters, won’t allow these items as part of the production budget. Contingency—Production is unpredictable, and a contingency—typically a 5-10% buffer—protects you from the unexpected. This is a commonly accepted line item, but unfortunately, some funders do not allow it. I believe strongly that a contingency is an essential part of any budget. But if it is cut, you may have to adjust line items throughout the budget to be prepared for the inevitable surprise. Fiscal Sponsor Fee—This is the administrative fee paid to the nonprofit organization that receives grants and charitable donations on your behalf. Note that this fee is budgeted as a percentage of the charitable funding you receive, but is not applied to funds that can be paid directly to the production. Not quite. It’s time to look back at the topsheet and consider the big picture again. You’ve budgeted your film the way you’d like to shoot it, but can you actually raise this amount? If you must meet a target budget, this is the moment to explore compromises that could reduce the budget but still maintain the project’s initial vision. What kinds of deals can you get? Can you shoot for fewer days? Use a smaller crew? Decrease travel? Change workflow? Of course, you may decide to take your full budget, map it into phases (as described earlier), and then focus on raising the funds for the first stage. Get started, and make that fundraising trailer. Many great films have been made phase by phase like this. In all the ways that we have seen, budgeting is as much an art as a science, and it reflects, and can support, the dynamic, complicated, beautiful process of bringing a documentary film to fruition. Happy Budgeting! For more details, a good place to start is the book Film and Video Budgets, now in its 6th Edition. It has several sample documentary budgets and includes detailed explanations of the rationale behind each line item. For a comprehensive discussion of music, footage, photo and story rights (and much more), check out Michael C. Donaldson and Lisa Callif’s excellent book Clearance and Copyright: Everything You Need to Know for Film and Television. For guidance on how much networks actually pay for documentaries, visit consultant Peter Hamilton’s site. Robert Bahar is an Emmy-winning filmmaker and producer. His latest film, The Silence of Others, which he directed and produced with Almudena Carracedo, won the Berlinale Audience Award, Sheffield Doc/Fest Grand Jury Award, and 21 other international prizes, including the Pare Lorentz Award at the 2018 IDA Documentary Awards. It will be released theatrically in the US in Spring 2019. Robert and Almudena’s previous film, Made in L.A., won an Emmy and was broadcast on PBS' POV series.